LG is preparing to showcase what may possibly be the world’s first commercially available rollable OLED TV at the CES Show in January 2019, according to a report by Engadget. The demo could be a prelude to the TV going on sale to consumers later in the year, the report added. The company previously wowed audiences at CES 2018 when it rolled out a 65-inch Rollable 4K OLED TV. That model was more of a prototype however as LG never actually released it, despite winning huge praise from attendees at the conference. HDTVTest was actually lucky enough to see LG’s rollable OLED display in an invite-only session. The technology was certainly impressive, with the unfurling being operated by remote control and the screen neatly folding itself away into a small base. The prototype also featured three aspect ratios – including a 16:9 full screen; a 2.35.1 cinemascope, and also a shorter infobar used to display media such as a sound equalizer or various applications including weather apps. Engadget in its report said its seen “internal documents” that indicate what LG is planning for CES, and the centerpiece is said to be yet another rollable display. This time however, the documents suggest the display may be an actual product rather than just a prototype. If so that would mean the display is much closer to market readiness, and could be a signal that LG is planning to ship out its first rollable TVs as early as next year. 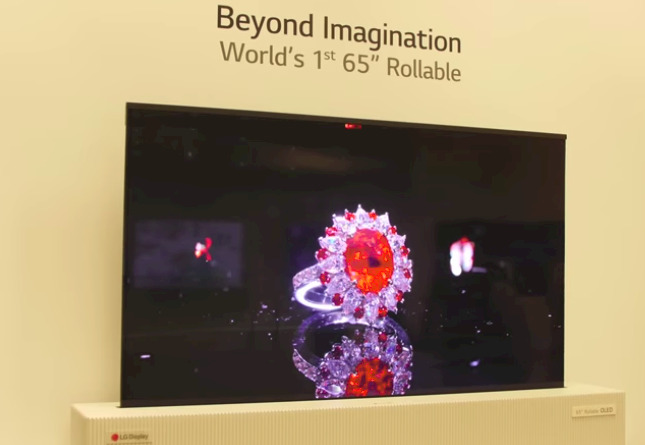 As to who would want to own a rollable OLED TV, the concept certainly has its advantages. For many buyers it would simply be a luxury item, albeit a useful one. For example if you want to place your TV in front of a window with a view, it would be possible to roll the screen down when it’s not is use so as to not obscure the sight. Another benefit is that the display is obviously much bigger than the device itself, making it much more portable, so one could simply roll it down and move it from the living room into the bedroom with relative ease. Rollable displays are also said to be more durable, lighter and thinner than their traditional counterparts. There are quite a few applications for rollable display technology in general too. Besides TVs, the technology could be used to make a new generation of mobile devices, laptops and PDAs, or even a device that wraps around a user’s wrist. Rollable displays would also be easier to integrate into a vehicle, perhaps unfurling inside the steering wheel or the dashboard. In any case it remains to be seen what LG is actually planning for CES. Engadget has a reputation for getting these things right most of the time, but the documents were vague enough that LG might well only be planning to display another prototype. In other words, we’ll just have to wait and see.